You got it you got it. The freeking cubs lost at home tonight. I thought they looked worse than the 7 to 2 score indicates. I have lost about 10 pounds since August 4. Half of it was over Sheppy Quest. Don't worry, I am sure I will find it again. Maybe what I should do is have one Sheppy Quest a month. If I can lose 5 pounds a month for a year, I should be at my ideal weight. I can probably even do it in 10 months. It depends on which chart you look at. The picture at the top of this blog entry is from me heading home west tonight. Kids, do not try this at home. Taking pictures with a cell phone while driving should only be attempted by trained professionals on a controlled track. Anyway, I think it turned out pretty good. It will be interesting to see what it looks like on a regular sized screen. This time of year is bad driving to and from work when you have to go east in the morning and west in the evening. I think the picture exaggerates how bad it is, but not much. This is the only city I have ever heard the concept of a "sun glare delay" on traffic reports. I guess part of that would be the gloomy places I have lived. 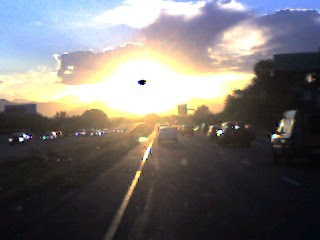 It is so sunny here in Denver most of the time. That was not the case in the mid west. They probably have a similar phenomenon in Florida or California. My sister in an email referred to her kids as the cutest. They are not. Mine are cuter. Hers are the third fourth and fifth cutest. I guess I cannot blame her too much. At least she does not have ugly kids like most of Tracy's side of the family. Oops... Did I say that out loud? I have too much money. Does anyone out there want to take some off my hands? I want to drive the Zamboni. I want to drive the Zam bone e.
I'm not crazy. I'm just a little unwell. I have been thinking about shaving my head. Sometimes I practically do it (or have some random woman do it for me), but never had the courage to go all the way bald. If the Cubs or Sox (the white ones) win the world series, I will get my head shaved (ha). The B.E.Peas will keep you rockin' on da dance. Dum dum diddley dum dum diddley dum dum diddley diddley. I cannot believe it is already October.